If you like the sound of an access control so far but would like to do more with your system, choosing PC based access control will give you even greater benefits. EA Group can install integrated security management software that is designed to be simple and recognisable. Administrators can be and often are fully competent and confident in using the software with less than two hours of training because of how intuitive the system is. Being able to manage the system from your desk is a major benefit of using an access control system with a PC. This convenience will make your job so much easier, you can update access permissions at the click of a button. PC based access control is so easy to manage; users can be added to, or barred from, the system within seconds. An integrated security system can control any site, from just one door up to hundreds of doors, with thousands of users. PC based access control allows you to grant users access as and when needed, according to time and place. You also have total control and flexibility over who has access, when and where to. Access privileges can be tailored as well. 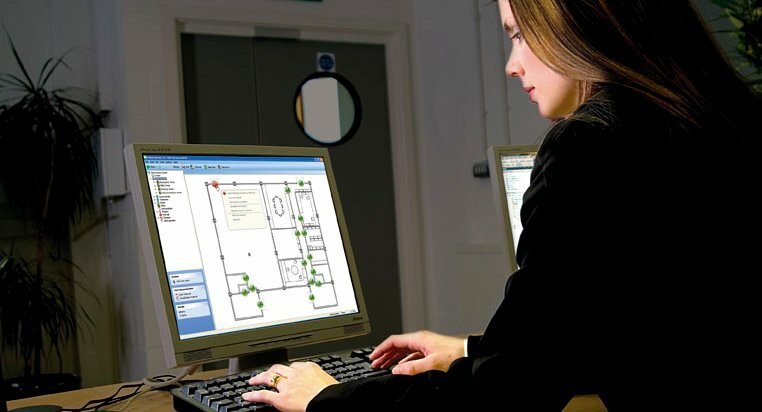 A PC based access control system means that you can view all staff and visitor movements on site, from your computer screen. The events screen will also show you when a door is forced. This helps you improve the security of your site and shows you when and where an event occurred. This is particularly useful for sensitive sites where an intruder can pose a serious threat and extra protection is a must. Being woken up in the middle of the night because the intruder alarm has been triggered at work is no joke, especially when it turns out to be a false alarm. You could also lose your police response if it happens too often. With our PC based access control system, false alarms and late night call outs can be prevented. A security system, integrated with your intruder alarm, stops you from entering the building if you do not have permission to unset the alarm. If you do have permission, the system unsets the alarm for you before unlocking the door. A PC based access control system can be set up to send an email or a text message to alert you if a specific event has occurred. This means you can get instant knowledge of what is happening on a site, even if you are not present. A PC based access control system can be used with a card designer package, meaning your access cards double up as ID cards. All you need is a card printer! Card designer cards look professional and give your business a really smart image. Our PC based system comes with a really useful and straightforward timesheet feature that gives you a comprehensive record of staff working hours. An accurate time and attendance report can be generated from the access control software, at any point. This is a helpful HR tool which makes it easy to keep track of staff movements on site and ensure employees keep proper hours. There are so many benefits to having electronic access control, you can even use it to control more than just one site. New sites can be controlled remotely from the same PC as before, meaning you can manage buildings from across the country, or even across the world. It makes expanding your premises hassle free. If you want to extend security beyond door control, you can link your CCTV footage directly to your access control system. Once your CCTV and access control are working together, you only have to manage one piece of software. You can view CCTV images against door events and alarm events from within the access control software. Should a barred token be used to attempt to gain access to your building, you can see who it was and when and where it happened. The access control system will also create a roll call report, telling you who was in the building when the alarm went off. This is a valuable feature which helps you to identify exactly who is safe from harm once the building has been evacuated. Not only does this give you peace of mind but should anyone be unaccounted for, you can pass on reliable information to the fire & rescue service when they arrive. How can we help your access control project?